When you are launching a new website, it is extremely important to think about the design. The outlook of any website influences the audience so much that some people literally able to close pages even have not look through the content, because the design may be too obtrusive or conversely too poor. But how to reach the perfect balance especially if you are not a design school graduate? Indeed, things are much easier then seem to be. Today the great spaces of the Internet offer many online stores selling ready-made website templates. WordPress is the most popular platform when it goes about running a blog or a news portal because this platform is the easiest to manage the content. And luckily there is a great plenty of WordPress themes suitable for particular this purpose as well as for many others. Here we have picked up the collection of the Best News Portal WordPress Themes by TemplateMonster provider. This company is one of the leaders in this niche on the web design market and they offer a wide choice of website templates for different CMS, and particularly for WordPress. It makes sense to mention that all themes in the list are modern, SEO-friendly, fully responsive to different gadgets and supported by TemplateMonster professional technical team 24/7. In addition, all products are easily customizable and packed with tons of plugins that enrich the functionality of the website. Enjoy! 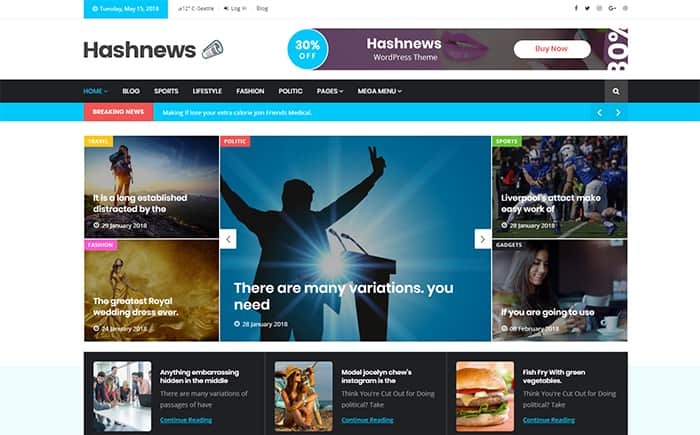 HasNews is a beautiful News WordPress theme released in 2018. It is made in a clean and unobtrusive design that allows focussing directly on the content. The theme is retina-ready, fast and built on the KingComposer that contains 40+ included add-ons. The theme’s package is also filled with 5 different creative layouts and more than 20 additional plugins that you can use to upgrade the website’s performance. 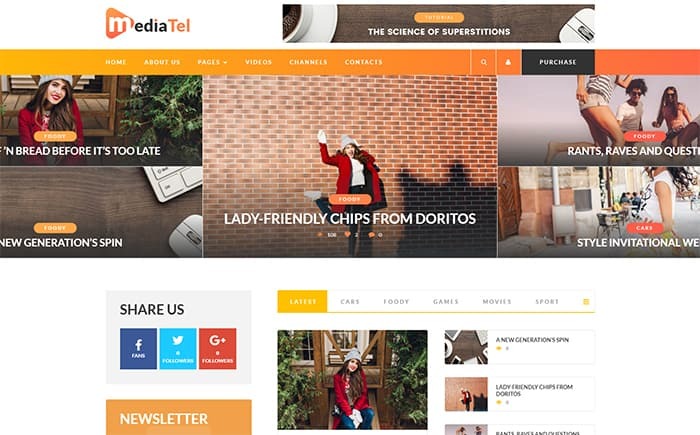 MediaTel is an awesome Media News WordPress theme allowing to add videos from Youtube, Vimeo, and other media resources. The theme is built on Unyson and Bootstrap framework and contains Google Web Fonts and Google Maps integration. You can install a demo version just in one click with a special installation wizard what allows to start working on the website immediately after you purchase the product. 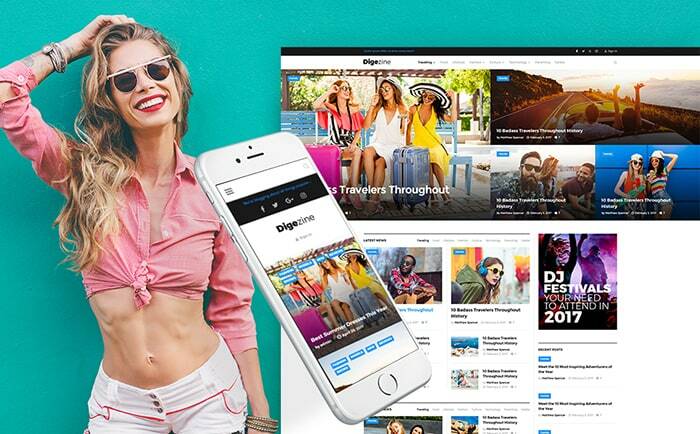 With Digezine you can create a sleek online magazine or the News portal since it’s appearance is made according to the latest tendencies and trends of website design. It is also bundled with the set of custom widgets and plugins to broaden the website functionality. Moreover, the theme is Ecwid-ready, what allows to add a store to your website just in several minutes. BlazingNews is a Magazine WordPress theme with the user-friendly interface written with the clean code. The theme is packed with various custom widgets like the Simple slider, post carousel and social media widgets that will help to enhance your website’s presence. With the integrated WordPress live customizer you can create a sophisticated and unique appearance without any coding knowledge. 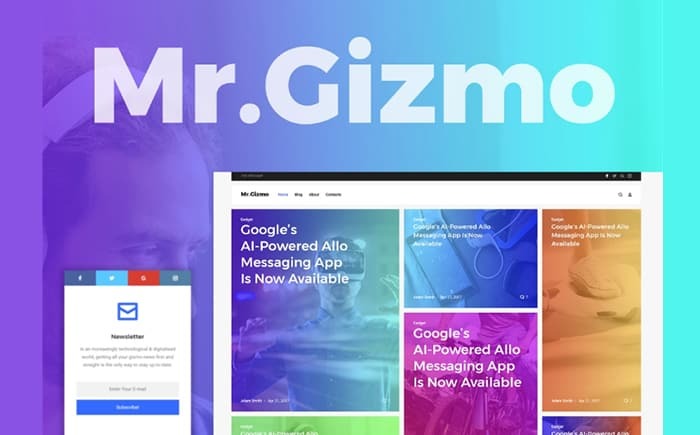 If you are going to launch a website spreading the gadgets and technologies news then take a look Mr. Gizmo. This WordPress theme is designed especially for this purpose and is filled with all the necessary functionality for the proper work of the portal. It is powered by Grid CSS technology what allows to arrange the content in a free way. Moreover, it contains a nice bonus – free 15 high-quality topical images that will certainly be very helpful for your activity. The Daily Posts is a professional news publishing theme created for easy spreading of news, press releases and other info in the world. It is integrated with the Social Sharing plugin allowing to comment posts and share them in social accounts. Some additional features like Performance Optimization and Sidebar Manager give an opportunity to add more functionality to the website and even to add a store since the theme is Ecwid Ready. Motiovix is a completely editable WordPress theme for media websites related to online video streaming. Created with the clean and responsive design, the theme performs the functionality of a gallery that allows users to concentrate directly on the video content. In addition, Motiovix has a Newsletter subscription box that permits users to get fresh videos right to their email inbox. The commenting system option is also included so visitors will be able to share their thoughts right on the website. When you are searching for the solution to capture every type of audience, take a look at Viral News. The integrated TM Gallery allows showcasing all kinds of news, pictures, videos, posts, and events. WordPress Live Customizer and Power page builder allows creating a remarkable page’s design without a need to learn code. Moreover, the multiple header, footer, and blog layouts could help to adjust a special view to your website. KingNews is another great solution if you are in a search for a functional WordPress theme for a News Portal. It contains a streamlined setup wizard, so the installation process will be as easy as the pie. The theme is also bundled with premium widgets to broaden the website’s performance, like Calendar, Social Media feeds, Newsletter subscription etc. The theme is built with the well-structured, optimized and clean code what will make your platform run like a well-oiled machine. This city portal WordPress theme is created especially for heavy content web projects. It is based on the Bootstrap technology that allows arranging text positioning in a card-like form for quick and easy eye-surfing of pages. BitNews is also packed with a big number of different plugins for building a feature-rich website’s layout. Simple Slider, Posts Carousel, Category tiles, Images grid are included along with many other useful tools. Weekly Journal is a WordPress theme that would perfectly fit the financial advisor magazine. The Built-in Bootstrap technology will be very helpful for comfortable and simple text arranging and formatting. Google fonts integration allows creating a unique and attractive texts and headings outfit. In addition, the template offers an easy navigation due to the drop-down menu and integrated live search. Globera is a powerful WordPress theme suitable for launching a science news magazine or a blog. It is packed with the number of different plugins and customization tools that allow launching a website quickly. The theme’s header contains a built-in easy-customizable carousel slider that can be used, for example, for showcasing the most popular or latest posts.